Many of us love the idea of having the sight and sound of moving water in the garden but shy away due to the perceived complexity and cost of installing a pond. Also, the thought of maintaining an open pond and potential concerns over child safety may steer us away completely. 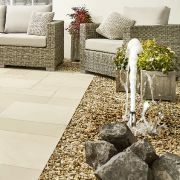 However, Water Garden Ltd have a range of practical solutions that tick all the boxes. Our Pondless Fountains offer the joys of a garden water display without the complexity of installation, the concerns over open water and are incredibly simple to maintain. So, what is a 'Pondless Fountain'? As the name suggests, pondless fountains have no open water as all of the equipment and water storage is kept below ground level and covered over with pebbles or decorative aggregate. When the pump is powered up, water jets will shoot into the air, creating an attractive and audibly soothing water display. 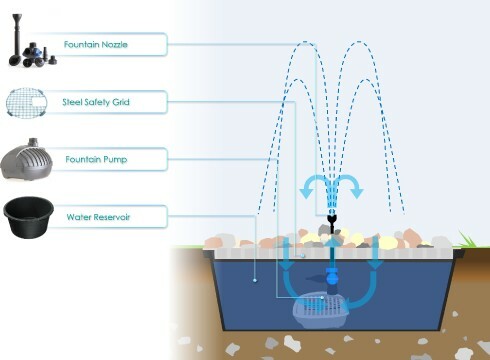 Essentially, all of our kits contain an underground water reservoir for storing the water, a submersible pump, steel safety grid cover and a decorative fountain nozzle which will provide the water display. Our larger kits also contain a rubber liner to extend the catchment area, allowing you to create much more dramatic water displays without digging a huge hole. How easy are the sets to install? Thankfully, these are a relative doddle to install and the main work can be completed by us ‘ordinary' humans! 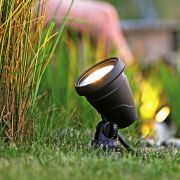 You may require an electrician to fit and connect the pump if you are in any doubt but we also offer solar fountains which do not require an electrician as they run on safe, low voltage power and do not need connecting to a mains electrical outlet. We have provided a simple set of instructions for all our pondless fountain kits but here’s a quick guide. Cover the grid over with decorative stones to hide the grid from view. Switch on and enjoy the sights and sounds of your new fountain. From small water displays up to large, impressive dancing fountains, the pondless fountain kits really are the perfect solution. Our steel safety grids can support up to 150kg (330lbs) of weight without additional support, making these safe for children or an inquisitive adult who may stroll over. 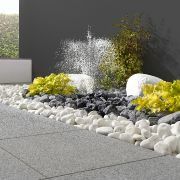 As the water is hidden under your pebbles, the sunlight is blocked so water quality tends to remain in good condition. Leaves and other debris are also trapped by the pebbles so the supplied pump needs very little maintenance. We provide a 20cm x 20cm pump access hatch so you can access the pump without the need to remove the pebbles off the entire grid. As the water is recirculated, there is no need to connect the water feature to a mains water supply – simply top up with a hose or bucket once in a while. Water Garden also offer a wide range of lighting options to illuminate your fountain, ranging from solar lights to mains powered warm white and colour changing spotlights to create stunning effects well into the evening time. For those who are looking for real impact, our larger pond-less fountain kits offer a range of extra features, such as dancing water programs and electronic control of the water display and optional lighting, all via your smart phone or tablet. If you are interested in our Pondless Fountain Sets or are looking for advice, feel free to call our team of experts on Portsmouth 02392 373735 or Contact Us via email.